and on the days when i feel a little overwhelmed i step back and remind myself that all good things take time and this is part and parcel of creating 'an atelier of sorts'. and quite honestly if all i have in life to feel overwhelmed by is shifting my business to a different location in my shed and online, then i should count my lucky stars. as much as i had hoped, and indeedy i came tres close to signing on a dotted line, my atelier of sorts is not outside of Mossy Shed but inside, shrouded by yards of lace and fabrics and i will do muchly of my atelier businessy busy stuff upon the world wide web. at the moment, my man is spending short bursts of quality time finding just the right place to call home, where upon we will work at building an online atelier of sorts for dottie angel. of course there are days i have looked at the jumbly bumbly which surrounded me and declared i was mad to think i could ever do this. and the days when boxes have turned up filled with eclectic goodness and i wonder if others will wish to purchase what makes my little heart sing. again i note, Mr Doubter sitting on my shoulder causing me to stumble. recently i was asked if i would like some tickets to go, well being across a pond it was not to be, but i did think perhaps a reader may like them instead. and then the very nice folks at CL Fair Headquarters said they had a spiffy code which gives a discount off the cost of a ticket for everyone. oh hurrah hooray! well that seems quite fine and dandy i thought to myself. so for all the nitty gritty on the CL Spring Fair in london this coming March 19th ~ 23rd you may wish to visit over here where you can read all about the peachy things that go on at the fair. things like crafting workshops, garden features and theatre, along with lifestyle theatre. from having a jolly good ganders at their website myself, i noted there are many folks to visit, listen and learn from and also quite the spectacular array of stalls to browse. a true jolly day out i have no doubt. if you would like to win a pair of tickets then please leave a comment along with your contact details so me and my trusty buddy from CL Fair Headquarters may pick a winner on Monday 3rd March. and if you cannot wait to see if you won, then you can book tickets now using the spiffy special discount code Blog10 to save. tickets are available by calling 0844 848 0150 or you can find everything online here. of course this isn't the most thrilling of giveaways if you happen to live miles away, or in another part of the globe, a bit like moi. but none the less, i do feel it is quite a cheery one for those living in the old uk who have had quite the terrible time of late with the wintery ways of weather. on monday i had quite the marvelous good fortune to stumble across a dumptie at the thrift store. however when one is faced with a dumptie of the utmost rarest kind, what is one supposed to do, "walk away from the dumptie" the little voice wisely advised me. "tis a rare old dumptie and so terribly useful" the other little voice wisely tempted me. this was so true for how often does a dumptie become a handy dandy basket to house all manner of crappity crap. upon arriving home with dumptie in hand i noted in the good old days i would have rushed to the drawer, seized my trusty paint brush in my mitt and got busy with a lickity lick of paint. but no, not now, no sirree, my wild and wielding paint brush days may be behind me! shock horror! oh how far i have come, or fallen, i do not know, nor do i care... for i have decided to ponder the fate of my dumptie, i cannot deny my attraction to his 'au naturelle' attire and am thinking he may just stay as he is. despite my distracted ways of late i have high hopes of popping some handmade goodness upon the dusty old shelves of my little etsy store this coming march. i am most happy with the handy dandy project sacks complete with a handy dandy dottie angel notebook and pencil. i am having to use all my willpower not to keep a project sack for myself. they have sat upon my table for several weeks now and it is all i can do not to stuff my yarny project in one, to keep it safe and snug. i tell myself this is not the doings of someone trying hard to be more responsible and grown up when it comes to their work and their shop. oh yes indeedy! i know i have been a little distracted of late, however not so much i forgot what day we are on. no sirree! we are on 'giveaway day' again. "I go to pick up my 5yr.old granddaughter at school every Wednesday afternoon, and when I walk into her classroom, see her sweet smile my heart skips a beat. Then she runs to me, with arms open wide, my heart swells with love. we do arts and crafts after I get her home, we have so much fun together." and this is just so perfectly perfect because quite honestly i am hopeful one day i will be a granny just like Gail and get to craft every wednesday afternoon with a 'small being' too. on friday i had an epiphany and since then our Mossy Shed has been turned upside down. but a massive, need my lads of three to help, sort of upside down. forsaken souls throughout the shed are quaking in their little forsaken feet. i tell myself rome was not built in a day and thus, my epiphany cannot be also. all crafty ways of the past quite a few days must come to a halt. for crafting cannot take place if my studio space no longer exists. i told myself all will be well. my epiphany has not led me down a path of madness and nutso-ness even if it feels like it at the moment. ah, yes indeedy! already in february, already half way through! this little hearty string of happy is a dingly dangly sort of little string and you could make it with as many hearts as you would like. it is very easy peasy and requires the most simpliest of hand stitching so perfectly suited to small beings and little critters. although you would have to observe as there are little things which go into the making of this. folding your fabric in half, wrong sides together, cut out a heart, do not fret about it being perfect, just snippity snip away. pin together (if you wish) and with needle and thread, blanket stitch around the edge. if you cannot or do not wish to blanket stitch then may i suggest a small running stitch or back stitch would suffice. before you find your way back to the beginning of your stitchy ways, stop and carefully pop a bit of stuffing into your heart, not alot, but just enough. holding the fabrics together (perhaps with a pin again) complete your stitching. when you are happy with the amount of hearts you wish to make, start stringing them together and be sure to add a loop at the top for maxium dingle dangleness. one: leave a comment telling me what makes your heart skip a beat and be sure to leave a way for me to contact you. if you are not able to leave a comment on my blog, then you can email your comment to tif@dottieangel.com where i will put you in a special folder marked 'special folder' so i do not lose you. this week i got a little blinging carried away. my new crafty basket is a sturdy little workhorse made fairly and tradely. what i like muchly about my sturdy little friend is he has room for everything and if i wanted i am sure my kitchen sink as well. however there is one thing i do not like about my little friend and that is his rather catchy pokey sticky outtie bits. on the outside this is tres okay, (although i fear for my woolly tights at times) but on the inside, this is a big old 'no~no', for precious cargo such as yarny goodness must be carried to and fro to where i may come and go. with this in mind i bought my little sturdy crafty basket knowing a liner would be the order of the day. 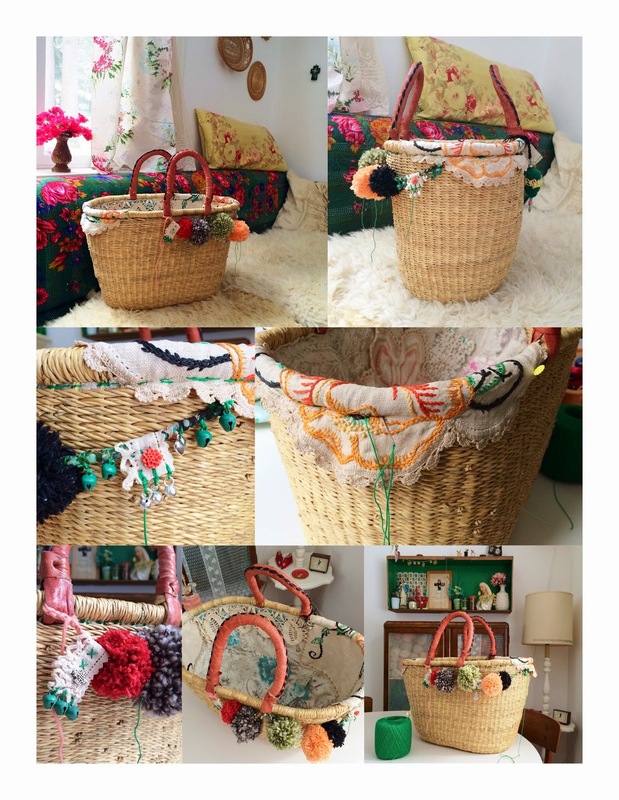 my first intention was to make it the usual way, shaping a large piece of barkcloth around the outside of the basket to get a nice fit for the inside, pin and stitch together with Miss Ethel and turn the right side around and plonk inside the basket, et voila. however this did not go according to plan for i spied a scrape of barkcloth with doilified ways lurking in the corner of my studio. and so many many moments past where i patched and pieced the whole liner by hand, adding as and where needed, till the whole inside was done. my man inquired if this was a matter of emergency whilst scrubbing the bathroom. i replied i was doing research of the utmost importance. on sunday after my little basket buddy had his new coat we spent quite a few more moments 'blinging' like i have never blinged before. well actually i probably have, i appear to be unable to not bling, but i think this was quite a mammoth blinging session therefore i have decided it is my most blinging moment to date. after a while i declared to my basket i was done, there would be no more blinging for him or for me. when in doubt, 'step away from the blinging' is my motto from now on. i test drove my basket buddy and his blinging goodness to work yesterday. he did a mighty fine job at carrying everything but the kitchen sink without a snag or a catch insight. i also admired how well he wore his bling considering he is a 'he'. i decided to ignore how heavy he was, blaming it on my water bottle and not his blinging weight. my crafty cogs have been churning nineteen to the dozen. they are whirring so fast i am having quite the trouble focusing on anything else. i have the urge to purge. i made a little crocheted hat for my little stool following this here bit of information. i have had my new specs on for 5 days now. they are old but new to me frames from the 50's i believe. the lenses are stronger 3 in 1's and it was a little tricky for a few days. i like them muchly except for the fact they keep sliding down my nose, then i don't like them muchly at all. mister muchly went out in the snow yesterday, he did a terribly good job at building a snow man. i feel sorry for my man at the moment. i am a bah humbug, alas and alack (yes more woe) he is at the receiving end of my bah humbuggish ways. last night, Miss Ethel and i got busy. it was quite the tearful reunion. i am plotting and planning to go to a knitting convention. i cannot stop taking photos in square shapes. rectangles look all wrong to me now. i thought as we were in february and folks like to make hearts, i would share them. i do believe hearts are not just for valentine but all year so i would not call these valentine hearts nor suggest you can only make them with valentine in mind. (the pictures really speak for themselves). start wrapping your little heart hanger with your frayed strips. knot them together and continue until the whole heart is covered and carefully pop a pin in place to stop everything unraveling. if you are having trouble with the fabric slipping, you could put a bit of mod podge on the wire hanger before wrapping it. take your needle and a length of embroidery thread (if its the sort that splits into strands, use it whole) and remove your pin and do some natty bits of stitching to keep things in place. see where the other knots are, if frayed ends are sticking out too much, stitch them down too. you may wish to just stitch all the way around or you may not. 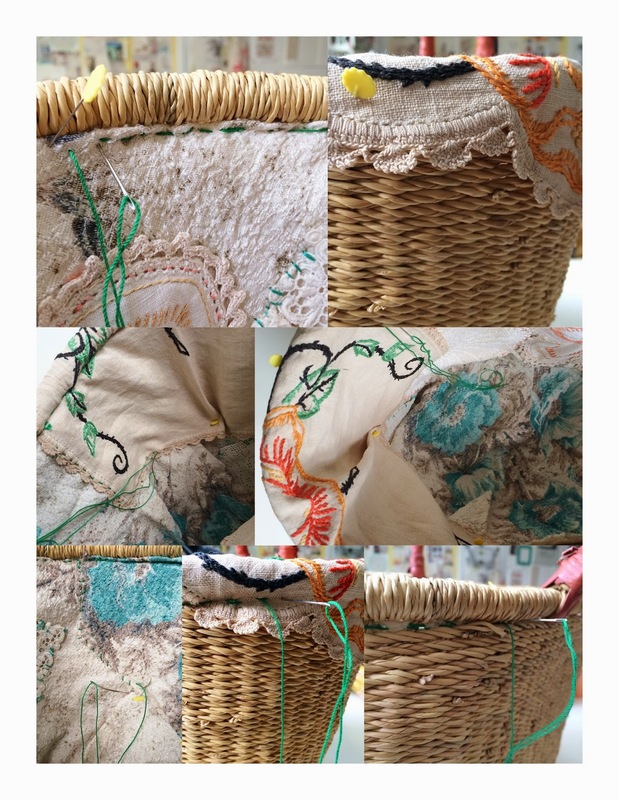 take your old bits of lace and start to put in place, pin down and begin to stitch being sure to keep things taught. add another piece.